The sales will include heavy discounts on all their items. The company is claiming that the customers will get the benefits up to 10 Crores from this sales. It is aimed that the festive season will make the growth about 500 percent to the company. It is a festive sale by the firm. Paytm is offering great offers in this Diwali sale. 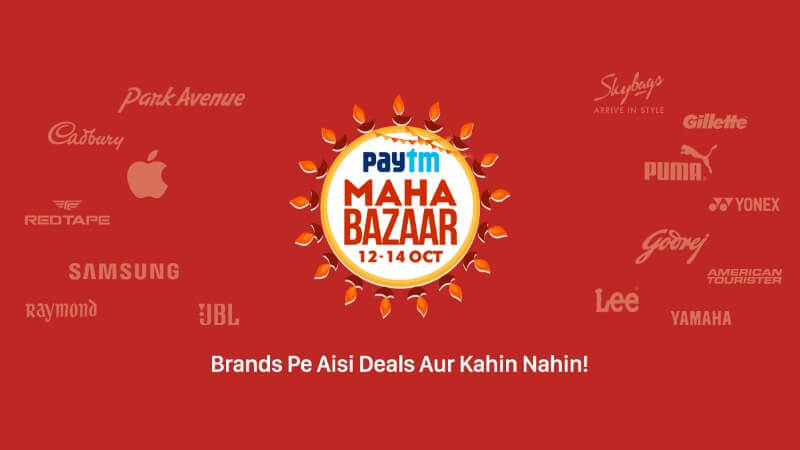 PayTM MahaBazaar Sale is offering discounts on Mobile and accessories, electronic items, Men Clothing, Shoes, Watches, Home and Kitchen offers, Sports and fitness offers, automotive offer and toys for kids. The company is offering a cashback up to Rs. 7000 on certain iPhone 7 model. We are here bringing some Paytm offers of the MahaBazaar Sale. Sony 43 inches LED smart TV is available at Rs. 43,400 (Rs. 9,999 is added back to your Paytm wallet using the coupon code LAPP10). This is the very effective price for a full HD resolution, 178-degree viewing angle and 20 W speaker output smart LED TV. Samsung 43 inch smart LED TV is available at Rs. 47,502 after the cashback in your Paytm wallet. For the Apple lovers, Paytm is offering great deals. Apple’s iPad Pro 32 GB WiFi is now available at Rs. 62,770 (The cashback of Rs. 400 for all iPad but cashback of Rs. 5000 using the coupon code GET8). iPhone 6 with a storage of 128 GB is now available at Rs. 50,989 after the cashback. There is major cut of Rs. 9999 in the price of the device. Apple Smart Watch 42mm with the Milanese loop is brought at Rs. 44,500 after the cashback of Rs. 8000. Even the Xbox have reduced to Rs. 31,500 and Rs. 26,499 for the 1 TB and 500 GB variant. Speakers have a great deal in this sale with 30% discount and additional 15% cashback. In the competition of this sale from Paytm, Snapdeal is also conducting other sales from Wednesday which will offer great discount on iPhone 7 and many more products. Amazon is also ready again with massive discounts under the name ‘Grand Indian Festive’ starting from 17 to 20 October. Amazon is offering 10% cashback and additional 15% cashback on using Citibank card shoppers card. Amazon is offering one day or two-day delivery if you are Amazon Prime subscribers (Prime subscribers need to pay Rs. 499 per year). Although Paytm has joined this league of sale after so long but they are providing huge discounts. Share your deals with us. And stay connected for more information.